To Eversleigh Illereichen - a guest house with charm and flair. Enjoy the calming atmosphere in this house built in the 18th century. 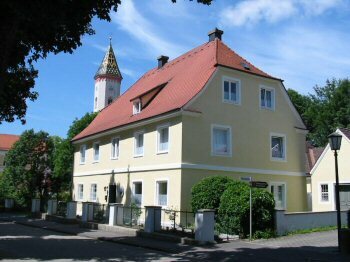 The house nestles in the historic part of the village, near the church and the estate buildings where Castle Aichheim once stood. The charming village of Illereichen is part of the Market town of Altenstadt on the river Iller in Bavaria. Besides their particular ambiance, all rooms offer en-suite facilities, fridge, cable-TV, telephone and internet access. Go on and have a closer look at our guest house.